Elderberry (Sambucus Nigra) is used for its antioxidant activity to improve vision, boost the immune system, improve heart health and for coughs, colds, flu, bacterial and viral infections and tonsillitis. 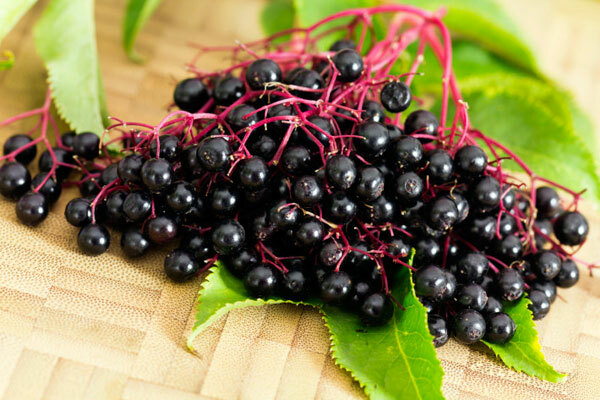 Elderberry juice was used to treat a flu epidemic in Panama in 1995. Elderberries contain organic pigments, tannin, amino acids, carotenoids, flavonoids, sugar, rutin, viburnic acid, vitamin A and B and a large amount of vitamin C. Flavonoids, including quercetin, are believed to account for the therapeutic actions of the elderberry flowers and berries. Elderberries have been a folk remedy for centuries in North America, Europe, Western Asia, and North Africa, hence the medicinal benefits of elderberries are being investigated and rediscovered. Elderberry is used for its antioxidant activity. Bioflavonoids and other proteins in the juice destroy the ability of cold and flu viruses to infect a cell. People with the flu who took elderberry juice reported less severe symptoms and felt better much faster than those who did not.